The joyful, if slightly fanciful tone of the Evening News banner ‘Beckham Signs for Hibees’ combined with the more sobering ‘Posh Spice seen in Jenners’ that appear early on in Dundee Rep’s stunning Proclaimers musical by Stephen Greenhorn sum up its many vicissitudes. As it proceeds, full as it is of unashamed sentimentality, dark reflections, occasional violence, passionate yet often unexpressed love and twinkling dry humour, there is much in it that epitomises the Scottish character far beyond its Easter Road locale. In it, we meet two young soldiers nervously policing a dusty roadblock in sandswept Afghanistan, praying for survival in a pointless conflict. 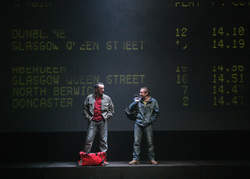 But survive Davy (Keith Fleming) and Ally (Kevin Lennon) do, and return to Edinburgh where Davy’s sister Liz (Gail Watson), a nurse, awaits Ally. But all is not well at home, with dad (John Buick) on the sick, and mum (Ann Louise Ross) scraping a living as a cleaner on the Britannia. They become estranged by news of an old affair, while Davy’s new relationship with Liz’s nurse friend Yvonne (Emily Winter) is embattled by his lack of emotional articulacy. Ally finds life at the call centre a strain, particularly with news that Liz seeks a better life as a nurse in Florida - guess where ‘Letter From America’ comes in? At no point does James Brining’s production wander far from the political themes that underlie Greenhorn’s ingenious script. After an encounter with the PFI management-speak of her boss (played by Irene Macdougall) in an NHS hospital beleaguered and impoverished by privatisation there’s a real poignancy to Liz’s singing of ‘What Do You Do When Democracy Fails You?’ Meanwhile Ally’s commentary on accent coaching at the call centre humorously sums up much about cultural repression across the UK. The earthy, emotionally immense, often cuttingly witty lyrics of The Proclaimers (arranged by Hilary Brooks) set it all off stunningly. There are some splendid performances, too, with Watson’s winsome, emotionally confused nurse a standout and Ross’s rendition of the title song over Buick’s (also quite splendid) ailing husband capable of wrenching a tear from the bronze statue of Wellington atop Leith Walk. The final, exuberant effect of all this is a combination of the Killy Cup Final and that time we put six past the Jambos - but if you’re not so comfortable at the Cabbage and Ribs (also appearing in this production) you’ll have to find your own equivalent.